I have something to confess, fat fashion fans. I went crazy. Nuts. Off the wall. Absolutely bonkers. I know. I’m a terrible, terrible person. BUT £4 was on necessary/repurchase items, and the rest… I just couldn’t resist. I went into Poundland to pick up some razors, and to see if they had a face powder or mascara to pop into my gym make up bag, as well as picking up a scented candle. Well, as I have heard from many other bloggers, they had branded make up products. For £1 each. So, I picked up a Wet ‘n’ Wild pressed powder (FOR A POUND!?) and a Sleek Lash Out mascara (ALSO FOR A POUND!?) to pop into my make up bag… and then picked up two Bourjois Ombre Stretch eyeshadows (FOR A POUND EACH!?). I couldn’t resist the eyeshadows, and even though they go on pretty sheer and ‘Intense Black’ is much more of a grey colour, they are buildable and blend really well. So FOR A POUND not bad! I also picked up a scented candle. I also picked up four more. Seriously though. Seriously. LOOK AT THOSE?! And for a pound each? I couldn’t resist. I had so many more and it was all I could do to pick five. The red M&M’s one is Red Hot Apple Cinnamon and it smells AMAZING, as does the blue Fresh Linen one on the far right. 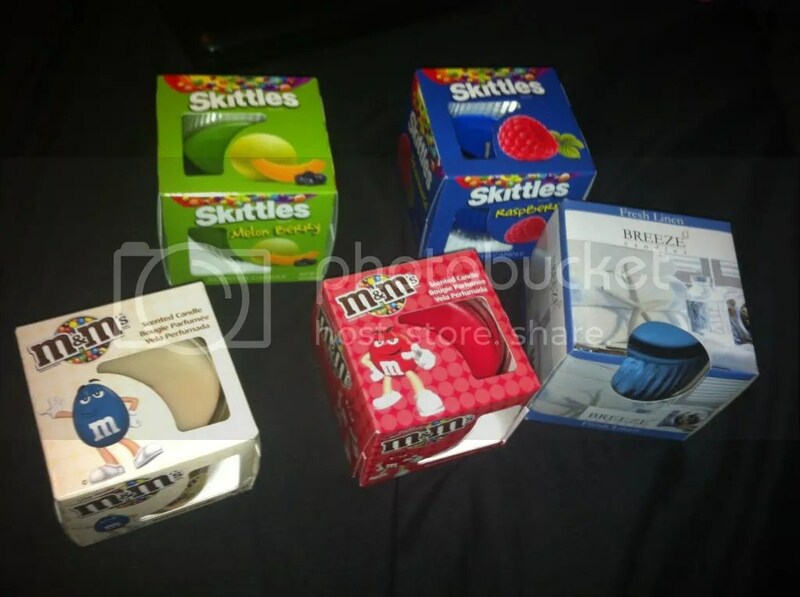 The white M&M’s candle is a beautiful, yummy vanilla, and the two Skittles candles are lovely and fruity flavours- Melon Berry and Raspberry. I love them. I’m so impressed at the quality of them. Seriously, Poundland? Well done. So yes. I spent. But, less than £10? It could have been much, much worse. So I’m not too angry with myself. To make up for it, I’m considering adding five days onto the ban, making it 65 days. Have you found any bargains in Poundland, fat fashion fans? This entry was posted in Beauty, Hair, Makeup, Fashion- High Street, Fashionista Musings and tagged Bourjois, Candles, Poundland, Sleek, Spending ban, Wet n Wild. Bookmark the permalink.